Morrison Estates have been letting properties across Dublin for over 20 years, and can be relied on to provide a professional service in compliance with all relevant RTB legislation associated with the lettings process. We set ourselves the highest standards by being members of the Institute of Professional Auctioneers and Valuers (IPAV), and adhering to the Property Services Regulatory Authority (PSRA), while operating to codes of practice set out by IPAV and the Royal Institution of Chartered Surveyors (RICS). Our aim is to provide you with the stability and security that you would expect from Dublin’s leading independent estate agent. We like to work in partnership with our landlords. Unlike most other agents, we take our management fees monthly throughout the duration of the tenancy. This is one of the reasons we are quite particular about the quality of the tenant we will introduce. We understand that your requirements as a landlord are as individual as the home you are letting, whether you have one investment property or a large portfolio. Our staff have extensive knowledge of the local market and the type of tenant most frequently drawn to the area. This experience enables us to find the most suitable tenant at the best price. We’ll create a bespoke marketing campaign. We’ll present your property at its absolute best, with professional photography, floorplans and carefully worded brochure text. We will then spend hours on the telephone to our applicants, alerting them to your property as soon as it becomes available and encouraging them to view. We have thousands of registered applicants actively looking for property in the local area, as well as the many enquiries we receive through our website as well as using the largest property portals in Ireland for our marketing. Once a suitable tenant has been found and you are happy to accept them, we will then work quickly, obtaining references and completing all the paperwork, to make sure the move-in happens smoothly. Landlords often request corporate tenants for their properties as they are aware that, generally, rent is paid in full, on time and that their rental return is maximised. Properties let to corporate tenants are well maintained and looked after as the occupants are a reflection of the company they work for. Corporate tenants are often contracted to work for several years, minimising void periods for landlords. Our Corporate Lettings and International Relocation department works with a broad range of corporate tenants, from graduates to lawyers, bankers, company directors and diplomats. We also secure tenancies for embassies and government departments. The team can handle 100 enquiries a week and, as such, we have access to a fantastic pool of reliable tenants. Recent corporate tenancies have includedsome of Dublin’s largest Banking Establishments and largest International IT and Social Media companies. Often these companies and corporate clients require a professional contact for the duration of their tenancy should they have any queries or if any works are required during the tenancy, with their preference being to move into a property that is managed by Morrison Estates. Morrison Estates have a team specialising in Prime Lettings services to cater for landlords and tenants who value working with the most experienced and specialised lettings team in the Prime Dublin market. Our contacts across or our relocations partners throughout Dublin means we’re able to develop relationships with the perfect tenant for your property. Morrisons Prime Lettings gives you access to a dedicated team of our most experienced managers and lettings negotiators to ensure a personalised lettings experience. Our Prime lettings agents will ensure that both you and your future tenant have one point of contact from the moment they register and throughout their tenancy with our 24/7 tenancy repair services. We provide a unique service that blends prime Dublin market heritage with industry-leading technology to create a service that unlocks the true value of your property investment. All our Prime lettings properties benefit from a upgraded professional photography and floorplans to ensure your property is shown in the best light possible. Tenants who may not currently be based in Dublin are able to 'view' the property wherever in the world they may be, by us providing walk through video tours, ensuring maximum exposure for your property. The lettings experience at Morrison Estates is further enhanced by our modern website, and supported by our 24/7 tenancy software that converts into 42 different languages along with simple youtube videos on how fo fix simple repairs, along with landlords portal access to your online accounting that provides transparency over the entire lettings process. Aoife Keeney & Paula Richardson have over 10 years' experience in the property industry, and are specialists in corporate and high-end lettings. Perfectly placed to lead the Morrisons Prime Lettings department with a team of qualified lettings negotiators to ensure that this market is managed effectively by attracting the best tenants in the Prime Dublin market. 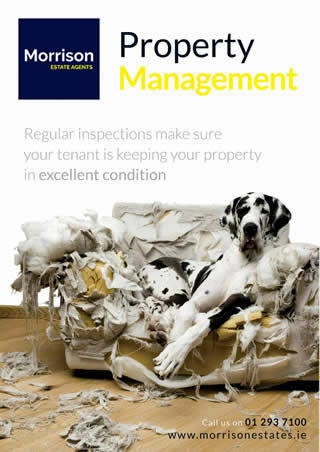 As a Morrison Estates landlord we offer you a variety of management services. Whether you wish to be involved in every step of the lettings process or would like us to take care of everything for you, our Property Management team can create a bespoke service accordingly. If you are considering letting your property for less than six months - whilst away on business, on an extended holiday or between longer term tenancies - then Morrison Estates specialist Short Let team can assist. We aim to make our fees transparent so that everyone knows where they stand when it comes to costs, and are available on request. We are regulated members of the PSRA (Property Services Regulatory Authority), which means that we are a licensed, insured agency with a regulated client monies account, and we are legally bound to the rules and process of this regulatory body. Would you like to download our lettings guide? Need to report a maintenance issue? All material on this website is provided for information only, and is not intended to form part of any offer or contract. Our policies and practices may change at any time without notice. Details of properties are provided from information received, and their accuracy cannot be guaranteed. Licensed and Regulated by the Property Services Regulatory Authority. License No. 002958.